Two months after 10 youths killed during school hike, parents demand Prime Minister form special gov't panel to investigate deaths. The parents of 10 youths killed in a disastrous flash flood more than two months ago in southern Israel have demanded that the Israeli government form a special commission to investigate the circumstances surrounding the tragedy, including the decision not to cancel the hike despite warnings of possible flash floods. In April, a group of 25 youths, most of them incoming students at the Bnei Tzion pre-army academy in Tel Aviv, set out on a hike in Nahal Tzafit. The school organizes such hikes every year as a way to enable incoming students to bond before beginning their year of study together. Despite flood warnings ahead of the hike, school administrators decided that the excursion would take place as planned. Ten of the 25 youths were killed after a flash flood hit the hikers. On Monday, parents of the 10 youths who perished in the tragic flood gathered at a press conference, calling on the Prime Minister to appoint a special commission to probe the circumstances behind the tragedy. 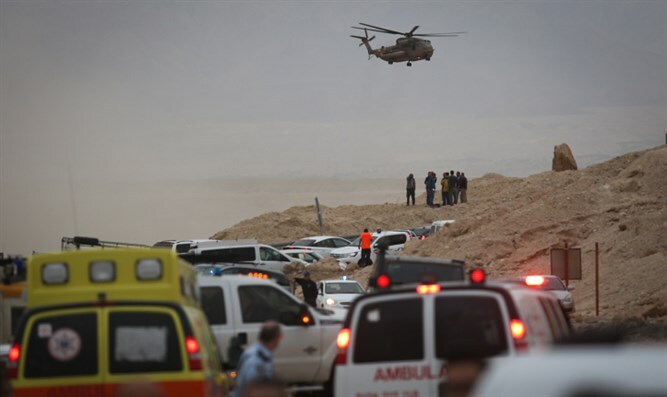 “We call on the Prime Minister to establish an independent committee, led by a judge, to investigate everything which led to this tragedy,” said Yael Cohen, whose daughter Romi was killed in the flood. Cohen chided government ministries she said had failed to properly investigate the tragedy or take steps to prevent future disasters. Itzik Ohr, whose daughter Ela also perished in the flood, said he and the other parents were determined to make sure that lessons were learned from the tragedy to help prevent future disasters. Two staff members from Bnei Tzion are likely to face charges, following recommendations by the police to indict them manslaughter and negligence. A third staff member is also under investigation.